When converting to All Orders if you have open estimates, sales orders and purchase orders in QuickBooks that you now want to process through All Orders. Your sales staff or web site create sales orders in QuickBooks but you want to process them through All Orders. You can limit the import either by date, or by the transaction's document number (in the above example, the Sales Order number). You can enter multiple document numbers by separating them with commas. 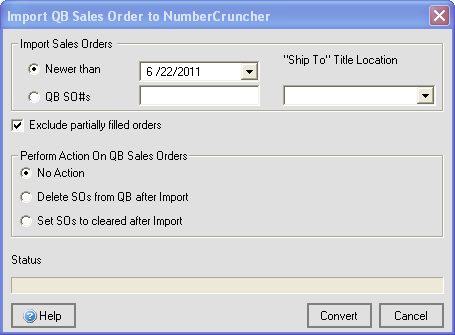 If you want to import the ship-to address from the sales order then select the field in All Orders you want to use as the title. No Action. Nothing happens to the transaction within QB. Delete SOs from QB after Import. After a successful import, the transactions in question disappear from QB. Set SOs to cleared after Import. Closes out the transactions in question after successfully importing them into All Orders.